Flybe is Europe's largest regional airline, and it operates the most domestic flights within the UK. This low-cost airline hits 62 destinations across the continent and in 2016 was one of the least delayed airlines, perhaps due to the fact that it flies to predominantly smaller airports. This airline is nevertheless subject to a large amount of cancellations. It also suffers from some long delays, like all airlines. 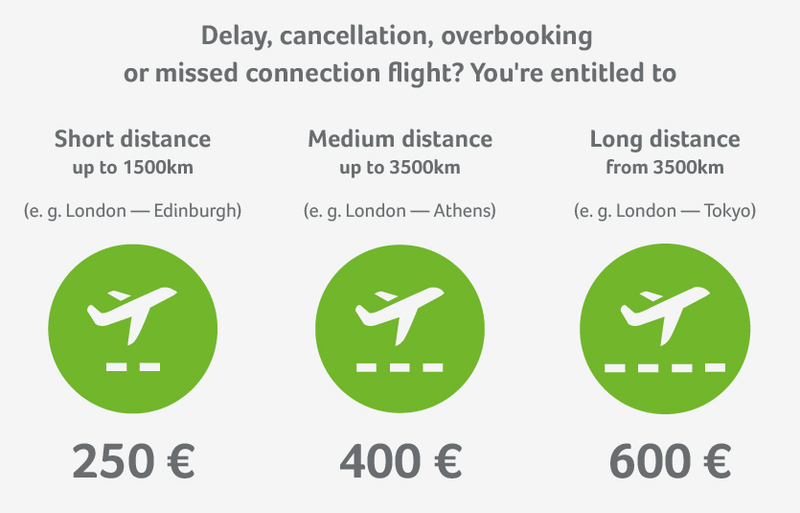 A Flybe compensation is appilcable for flight delays for more than 3 hours according to EU 261 rule. Passengers can claim compensation up to €600 for delayed flight caused by the airline. We help you to enforce your rights by putting you and Flybe on a level playing field. With our straightforward online calculator you can check if you’re eligible for compensation for free, and directly submit your claim online. Important: Don’t listen to any excuses! Vouchers for food or hotels or drinks don’t relieve the airline’s responsibility to issue you your compensation. If you’re unlucky enough to have a flight delayed for over 5 hours, you have the right to cancel it. The airline is obliged to either organise alternative transportation or reimburse you the cost of the ticket. In this instance you are eligible for a stay in a hotel and transport to and from the hotel and airport. Get in touch with the airline directly and ask them to commit to this in writing. Thanks to our expertise, we enforce compensation with a very high success rate. This is what enables us to promise a completely free service if your case should prove unsuccessful! Flybe flies 7 million passengers a year spanning 62 destinations, often connecting smaller airports or delivering passengers to long haul airport bases. It currently has a fleet of 84 made up of a mixture of various types of aircraft. Flybe were one of the more punctual airlines in Europe in 2016, however 146 of their flights were delayed more than three hours, meaning all those passengers were eligible for compensation. Much more alarmingly 667 flights were cancelled outright, which is large amount when compared to competitors. Flybe are one of the most cooperative airlines that Flightright deals with. They payout when they are supposed to and also issue the compensation in a timely fashion. It is possible to check-in online with Flybe up to 36 hours before your departure and as late as 2 hours before it. As always, it is advisable to do the check-in online rather than leaving it till you get to the airport which is likely to cause delays or leaving you standing in a queue for longer than necessary. More information about Flybe can be found here.